Lights are now twinkling on the Christmas tree at Cecil Square after they were switched on last night (November 29). The tree for the square was again thrown in doubt this year due to a lack of people able to organise the installation and light up event. Councillor Iris Johnston put out an 11th hour plea which was successful. Her son Paul arranged for Acorn Homes to fund the tree and there was help from the team at Community Ad, who worked on the documentation and paid some of the charges to KCC,Electrician Garry Went installed the lights and Jackie Young at Young’s nursery kept the tree for price at 2017 level and oversaw the installation. Unfortunately there was not time to arrange a switch-on event so it was a low-key affair. Iris said: “Applications for road closures have to be in and published 8 weeks before and Thanet council would need an events notice at least 12 weeks before. Monies would have had to be found for entertainers and all the paperwork approved by the safety advisory group. “I had about two weeks and I am very grateful to everyone who stepped up to help at such short notice and for the lovely comments we have had since. Special thanks to Acorn for funding the tree and its installation and Jackie Young of Young’s nursery for providing and spending days in awful weather putting it up along with Garry Went checking the lighting using his specialist knowledge and G39 certificate. 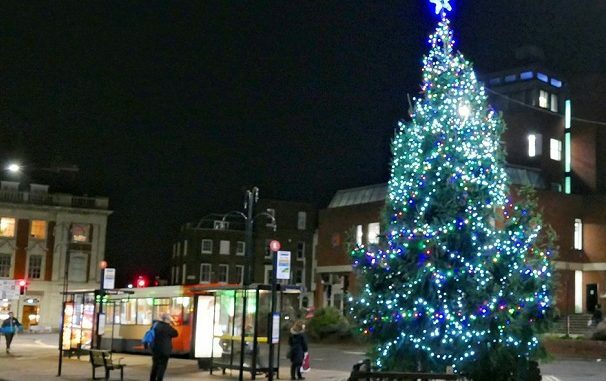 The tree in Margate Old Town will be lit up at 4.30pm tomorrow (December 1). Many congratulations to all concerned for the wonderful Christmas Tree with its very attractive lighting, which is now proudly standing in Cecil Square. Wonderful team work indeed.!! Christmas for me, starts, when I see the Christmas Tree in the Square.Thank you very, very much Councillor Iris Johnston, her son Paul and all the other brilliant people that made this happen.God Bless, a wonderful job done.